Three Australians have organised a motorbike rally along the Ho Chi Minh Trail to raise funds to stop child trafficking in Vietnam. The rally on Soviet-era bikes along Vietnam's tough back roads will start from Hanoi on Monday. Organisers Digby Greenhalgh, Glenn Phillips and Mark Wyndham, all long-time Vietnam residents and motorbike enthusiasts, will be joined by 14 other riders on the epic journey. Greenhalgh said the initial inspiration for the rally came when he was riding through Laos on part of the Ho Chi Minh Trail. "As a history student, I was immersed in the conflict from a stand-back perspective, but seeing 13-year-old kids out in the fields looking for scrap metal, not knowing if it's in fact an unexploded cluster bomb, got me thinking about how to raise money for organisations who work at removing bombs and mines," he said. 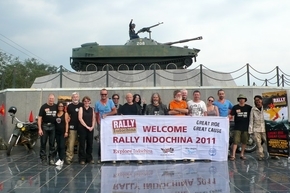 So far the Rally Indochina has raised more than $40,000 for charity. This ride will be restricted to Vietnam and money will go to a charity called Blue Dragon, which works to prevent child trafficking from Vietnam's poor central regions to sweatshops in Ho Chi Minh City. "I am most looking forward to the day in (the city of) Hue when the entire group will drive out to one of the centres Blue Dragon has set up in a particularly poor fishing village north of Hue to visit the children there," Greenhalgh says. It is hoped that future rides may go through Laos and Cambodia with money going to support unexploded ordinance (UXO) charities. Laos remains the heaviest bombed country in the world and UXO remains a serious humanitarian issue, as it also does in parts of Vietnam. Although Vietnam fought its last war in 1979, against China in a brief but bloody border conflict, and the nation has long shrugged off its war-torn past, remembrance will be paid to the struggles along the way. The ride will begin in Hanoi's outer rural district Ha Dong, at the War Museum. "We'll be driving through some of the most impressive limestone scenery in South-East Asia, following sections of the Ho Chi Minh Trail through Phong Nha and into the deep jungle north of Khe Sanh," Phillips said. Khe Sanh was the scene of a famous battle during the Vietnam War and was immortalised by Australian band Cold Chisel in the 1978 song of the same name. Nine of the rally riders are Australian, with others hailing from the UK and continental Europe, and all will be riding 650cc Soviet-era Ural motorcycles with sidecars. "The Urals are a classic motorcycle and there are few places in the world where you can still ride one," Phillips said. "The Urals were originally imported into Vietnam from the Soviet Union to be used by police, so they have a long connection here." The larger four-stroke engine means riders won't be enveloped in the clouds of grey smoke common to other Soviet-era bikes still used for rallying in Vietnam - the two-stroke Belarusian Minsk and the East German MZ. All three organisers have been in Vietnam between eight and 16 years. Phillips arrived to work as a sub-editor at the state-owned English-language daily Vietnam News in 2001, while Greenhalgh first arrived as a law student and later set up a motorbike tour operator, Explore Indochina, after numerous forays into the country's mountains.